(a) To provide a focus for action by the Residents in safeguarding the interests of Naphill and Walter’s Ash. (b) To provide a channel of information on matters affecting the Residents. (c) To promote an active interest in the two villages and their environment. The Residents Association committee is elected at AGMs and consists of Hon. Chairman, Hon Vice Chairman, Hon Treasurer, Hon. Secretary and 8 further committee members. Meetings are held on the second Thursday of every month, except August, at Naphill Village Hall when local matters for action and matters of interest are discussed. The Residents Association is funded through social activities such as dances and quizzes. Membership applies to all residents any of whom are welcome to attend Residents Association meetings, raise community matters, and apply to join the committee if they would like to serve the community in this way. The Committee has an extensive knowledge and experience of the planning system and can advise on new planning applications. At each meeting the committee examines all planning applications for Naphill and Walter’s Ash received by Wycombe District Council in the preceding month. When necessary it responds to the District Council with comments based on objective planning grounds and where appropriate, local concerns. Summaries of these planning applications and responses are published in the Naphill and Walter’s Ash Gazette and on this website. The Residents Association organizes local Community Speedwatch with Thames Valley Police, and has representatives on the Village Hall Council, the Hughenden Neighborhood Action Group, and the Hughenden Street Association Steering Group. It is considering applying for currently unrecorded rights of way to be added to the definitive map. 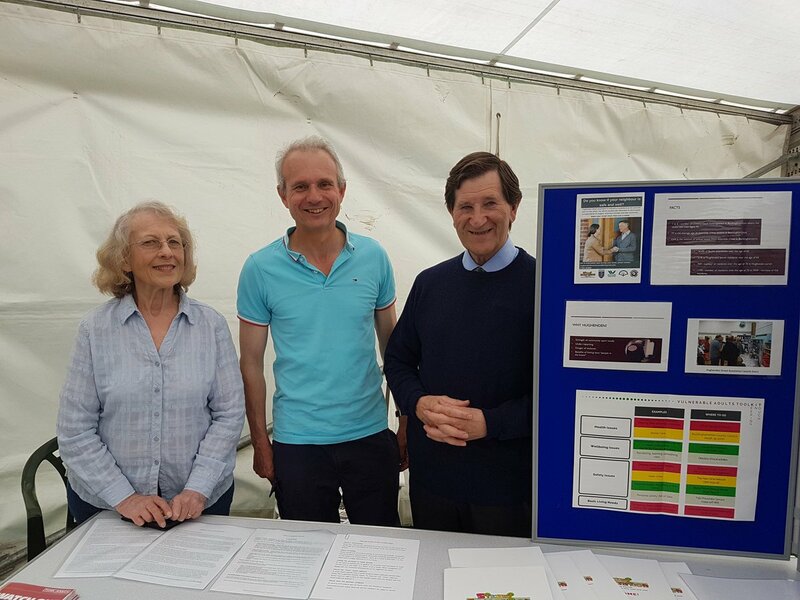 Newly appointed Lord Chancellor David Lidington joined Hughenden Street Association at Napfest and was full of praise for the recently established community scheme. David spent a significant amount of time chatting to parish residents Gloria Leflaive and Stan Jones, key members of the Hughenden Street Association. Representatives of the Association, already 60-member strong since launching in February, attended Napfest to encourage further residents to become the eyes and ears on their street. Led by Hughenden Neighbourhood Action Group, in partnership with Thames Valley Police, Trading Standards, Neighbourhood Watch, County, District, and Parish Councils, plans were formulated for the protection of older and more vulnerable residents. Nearly one in three of the residents across Hughenden is over the age of 60 and the fastest growing proportion of the population is those of 80 years and older. Residents who sign up to represent their street will receive an information pack covering important issues such as scams and doorstep crime to raise awareness for those who might be vulnerable. The pack also includes a signposting directory and details of local activities and organisations to direct individuals for support which can help to reduce loneliness and isolation. Anybody in the Parish can become a Street Member by offering just a little time to help their neighbours stay safe and well, creating a stronger and safer community. Due to the success in Hughenden Parish, further Street Associations are going ahead elsewhere in the County. NAWARA is represented on the Steering Group by Gloria Leflaive who is also the Ward leader for Naphill & Walter's Ash.